PARK SLOPE — Violence is rare, weapons are few and kids feel safer than ever at the Park Slope high school where students and parents are demanding the removal of metal detectors, according to state and city data. Park Slope Collegiate had only one reported assault with a serious physical injury between 2009 and 2014, the most recent years for which data is available, and bullying and minor altercations fell sharply during that period, from 60 incidents in 2009 to 10 in 2014, data from the New York State Education Department show. Collegiate's improving safety picture mirrors a citywide trend. Major crime has dropped 9 percent at city schools this year, and suspensions, arrests and summonses are down significantly as well, the NYPD and the Department of Education said Wednesday. "These decreases not only demonstrate our dedication to the city’s youngest citizens but they also illustrate students’ efforts to realize their full potential. We will continue to build on these successes and ensure this ongoing partnership fosters our city’s youth," NYPD Commissioner Bill Bratton said in a statement. The decrease in serious incidents comes as Collegiate students say they're subjected to overzealous policing from school safety agents, who recently handcuffed a student after he refused to hand over a pin that was keeping his broken glasses together. The NYPD said its Internal Affairs Bureau was investigating the incident and the Civilian Complaint Review Board is looking into it as well. The DOE said this week that school safety agents citywide will soon get more training, including a three-day course on crisis intervention. 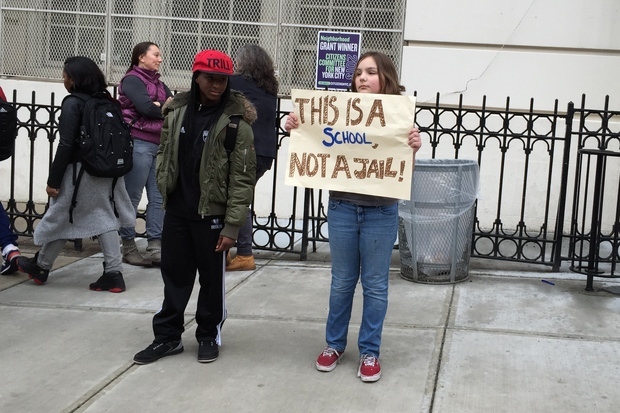 The recent handcuffing at Collegiate sparked a protest and renewed efforts by the school's parents to get metal detectors removed from the John Jay Educational Campus, which Collegiate, a combination middle and high school, shares with three other schools. Park Slope Collegiate's PTA held a rally last week demanding the city remove the scanners because they foster a "culture of mistrust" at a school where "unity through diversity" is the motto. The mayor's son, Dante de Blasio, attended the rally. Park Slope Collegiate's principal and PTA did not respond immediately to requests for comment on the safety data. School safety officers responsible for scanning the roughly 1,400 students at all four schools who walk through the metal detectors each morning confiscated three weapons carried by Collegiate students last year, according to the state data. The type of weapons recovered was not immediately available. No weapons were found on students from the building's other schools last year, state records show. Most students at the John Jay Campus say they feel safe in class, hallways and around school property on Seventh Avenue and Fifth Street, according to DOE surveys. Among the high school students at Collegiate, 82 percent said they felt safe in the halls in 2014, which is the same as the citywide average, according to Inside Schools. But some students said they understand the argument for metal detectors. "I do feel criminalized sometimes coming through the metal detectors, but at the same time I understand we do face possible dangers with kids maybe bringing in weapons," said Adrian, a 16-year-old sophomore at the Secondary School for Law who declined to give his last name.